Paul Clary’s agricultural background is in walnuts, but he has been able to transition to grape growing and winemaking quite nicely, albeit with a number of struggles. He grew up helping his grandparents farm their walnut orchard in El Dorado County. While attending University of California Davis, he majored in Biological Sciences, with an emphasis in Botany. He never actually ventured into viticulture or enology classes while there. In later years, when he decided to embark on his winegrowing adventure, he felt it a was a natural choice for him since a vineyard is something of an orchard in miniature. He purchased an old dairy ranch in the “Sonoma-Marin” area, at the headwaters to Chileno Creek about 11 miles east of Tomales Bay, and began the job of restoring the land. He decided to plant Pinot Noir and Syrah with the advice of his cousin, Mark Bailey, who has been a vineyard manager in Sonoma County since the early 1970s. A total of 15 acres were planted. Following his plantings, he enrolled in a University of California Davis winemaking extension course and was on his way. He offered his initial wines to potential buyers to taste, but poured them nervously, asking the buyers to “look past novice winemaking errors and try to taste the grapes.” Fortunately he found buyers for the grapes. He entered his wines into the Sonoma County Harvest Fair and his Pinot Noir won a Silver Medal and Syrah a Gold Medal and was in contention for Best Red Wine! A number of years passed and Paul continued to sell the bulk of his grapes, making a small amount of garage wine. He suffered through a divorce, but managed to keep his four kids on track. By the end of the 2004 growing season, he had more grapes than buyers and decided to make a commercial Pinot Noir. He crafted the wine at Topolos Winery in Forestville. This was a true hands-on effort as he had little help available. He bottled the wine in a pouring rain after it spent 14 months in 50% new French oak. The 2004 Clary Ranch Grower’s Reserve Sonoma Coast Pinot Noir was finally released in August of 2006. I tasted it at Pinot Days in San Francisco in June of last year and was impressed. So was the Wine Spectator, which awarded it a 91 score. Call it beginner’s luck if you will, but the fact is Paul had nurtured a vineyard for years in what turned out to be an ideal location for Pinot Noir, and the resulting high quality of grapes gave him the raw material for success. 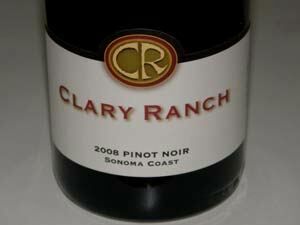 Clary Ranch Pinot Noir and Syrah can be purchased on the website or by phoning Paul at 707-773-3884. The wines are also placed in a number of top Bay Area restaurants. The ranch is located at 3641 Middle Two Rock Rd., Petaluma, CA 94952.